Here are tips on how how to make fall mantel decorating quick and easy by combining one, some or all of these readily available autumn elements. 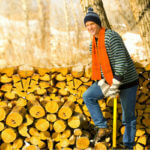 On your next trip to the supermarket, farmers’ market, or to an open space with oak trees, you can quickly gather the makings for dramatic but easy elements for fall mantel decorating. 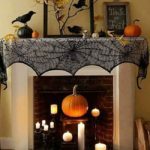 Whether you decorate the fireplace mantel just once with plans for it to last until winter or you decorate for fall and tweak the mantel for Halloween and for Thanksgiving, these fall mantel decorating elements will serve your fireplace well. 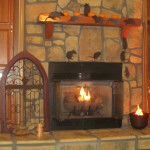 Pumpkins are a great element for decorating a fall mantel, and they are no longer limited to just orange. You can easily find a variety of pumpkins in all the autumnal shades of green, cream, yellow, gold, and white. And think beyond the traditional round jack-o’-lantern pumpkins, too. 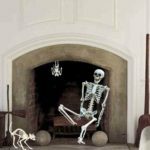 Be open to the many shapes, including delightfully bumpy skinned ones and squatty ones, that are available for fall mantel decorating. Want reusable pumpkins? 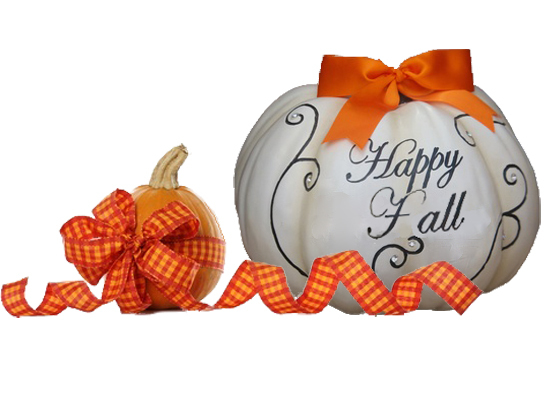 Some artificial decorative pumpkins and ceramic pumpkins look super realistic. Because they are so intrinsically visually interesting, it is super simple to arrange a variety of pumpkins on your mantel for a fall theme: Stack them, group them, scatter them, place them on wide candle holders. Tuck some silk autumn leaves, some dried babies’ breath, or some bittersweet branches among them, and your fireplace mantel has been decorated for fall! Croton plants are another ideal element for fall mantel decorating. 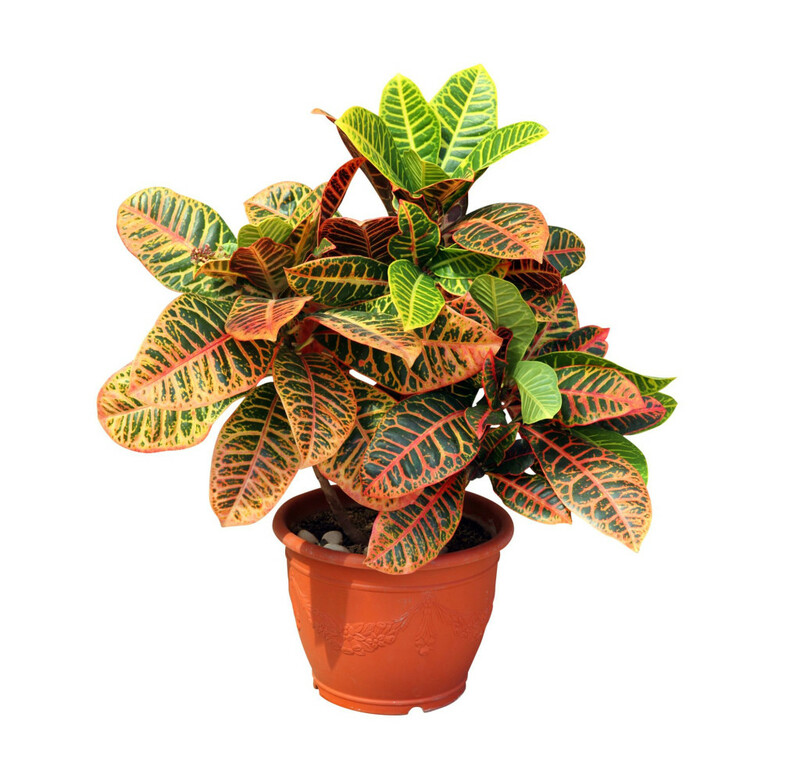 Crotons are evergreens and can be grown as shrubs in warm climates or as houseplants anywhere. They capture the autumnal colors of bronzes, oranges, greens, golds, yellows, Chinese reds and oh so many other fall colors. Commonly available anywhere plants are sold, crotons are naturals for use on a fireplace mantel decorated for fall. Simply place one or more potted croton plants in a pot that will fit on your mantel. Ideally the pot will be in an autumn-inspired color or in brass. 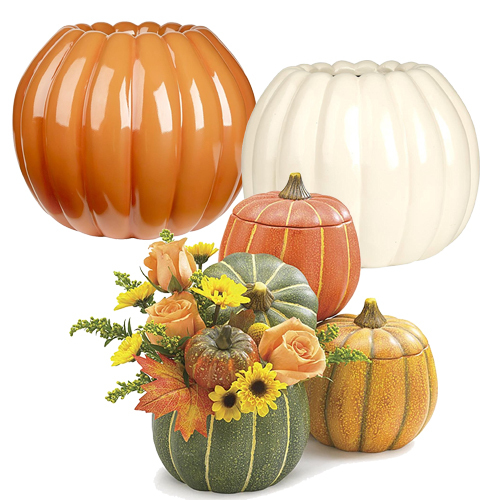 Hollow resin pumpkins and ceramic pumpkin planters are elements into which small potted croton plants can adorably fit! Consider adding croton plants on your heath, too, to complete the fall look and balance the design. If you don’t care for the colorful crotons or can’t find them, chrysanthemums, live or silk, are standard fall mantel decorating elements. Their range of autumn colors are also sure to include hues that are not only fall-flavored but also compatible with your color scheme in the room with the fireplace mantel. 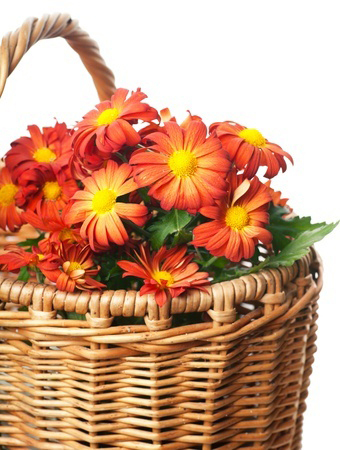 Place them in a basket. Or add a few silk leaves in fall colors around the base of the chrysanthemum pots, and you have a quick and easy way to decorate a fireplace for fall. Fill one or more glass bowls, pieces of stemware or canning jars with glass lids with a collection of small bits of nature associated with autumn. 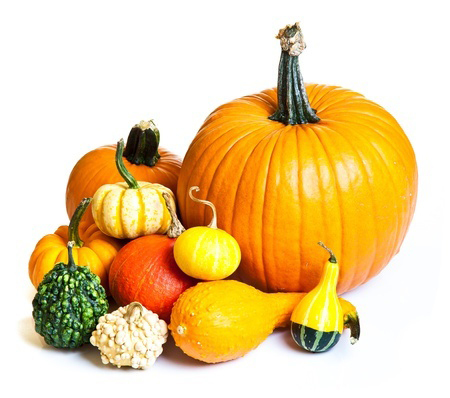 Consider miniature pumpkins, acorns of various sizes, and natural or silk autumn leaves. 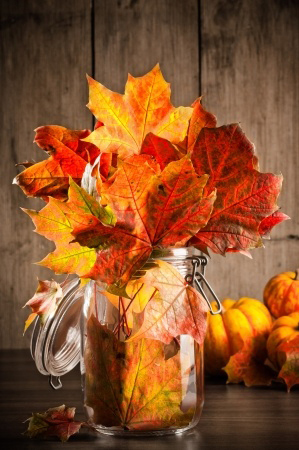 For a casual look, sprinkle some acorns or autumn leaves around the base of the glassware. Filling glassware with fall’s natural elements is so simple, the children can help decorate your fireplace mantel for autumn! You can often find lovely ribbons in fall tones at this time of year to add to your fireplace mantel. Look for gingham plaids and wired ribbons in fall browns, golds, and yellows. Ribbons are easy ways to quickly dress up ordinary pumpkins and gourds for fall mantel decorating. Just tie these ribbons around the middle or one or more pumpkins. Or tie the ribbons around pumpkins gift-wrap-wise with a bow on top. 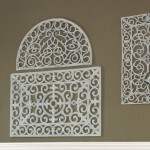 Let the bows’ streamers casually curl onto the mantel or even hang a bit over the edge of the mantel. Want to spend a couple of moments more for extra charm? If so, use a glue gun to attach acorns to the ends of the ribbons! Candles are a classic element of fireplace mantel decorating. 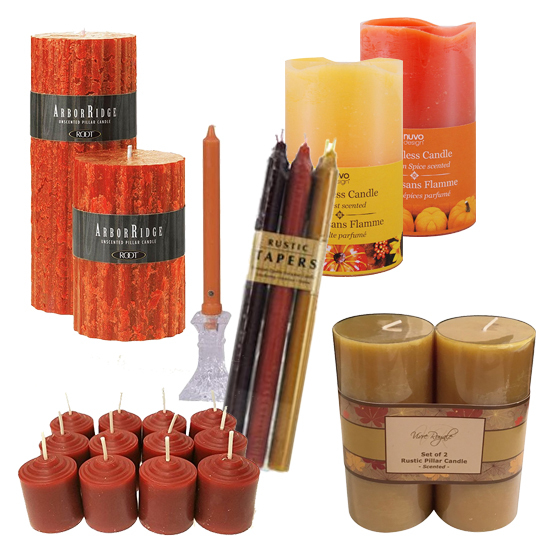 To get the autumn look, go for fall colored flameless or real candles. Involve the sense of smell by using pumpkin, pumpkin spice, apple pumpkin, autumn leaf and other autumn-scented candles on the mantel. 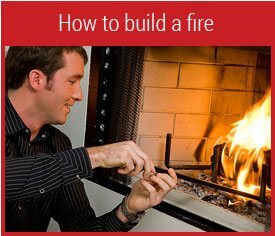 If you are not using your gas or wood burning fireplace, do not let that empty black hole below your lovely fall-decorated mantel distract from the beauty of your hearth. 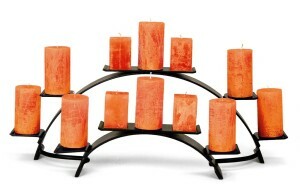 A fireplace candelabra sits inside your fireplace. 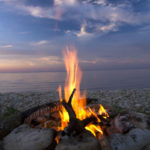 Lit candles create all the charm of a burning fireplace without the logs or ashes! Plus, with just a change of color of the candles you use, you can easily establish the seasonal look you want. 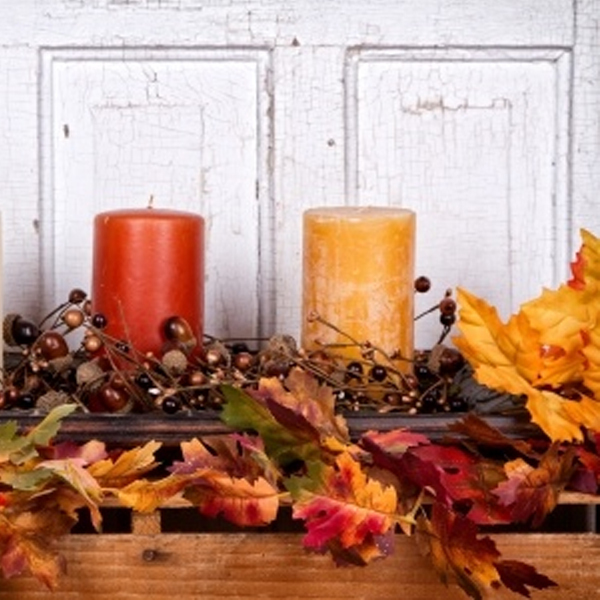 Give your fireplace candelabra an autumn update by replacing plain white candles with candles in fall colors. 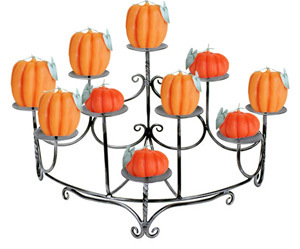 Or better yet, use pumpkin shaped candles to capture the spirit and colors of the season link in the Spandrels Fireplace Candelabra below. Mix and match these fall mantel decorating elements to create the quick and easy fall mantel of your dreams. Last updated by Susan at October 16, 2016 . I love the safety aspect of flameless candles too; I experience the scented candles even though. Love the vignette you created with them! !